Drat. I just managed to lose the text of a long post about the work I've done and the friends I've seen in Paris the past few days. Well, there you are. Here's the skinny: I've had a fabulous time, working a lot and sharing the days with some dear friends. Casey Toussaint and her incredible daughter Claire have been my partners in crime for this trip. They're both so bubbly and lovely --- you'll be able to see some of Casey's sketches on her blog rue Manuel Bis in the next few days. We've had dinner and tea, respectively, with those elegant Parisiennes Tara Bradford of Paris Parfait fame and Florizelle of the sophisticated and compelling le Divan Fumoir Bohemien. Tomorrow, our dear friend and Casey's almost neighbor, Ronell van Wyck (her fabulous blog is African Tapestry) joins us for the day. I will share with you what I've been working on this trip in the next days. I've been busy and productive and now I'm tired and cold. But happy! 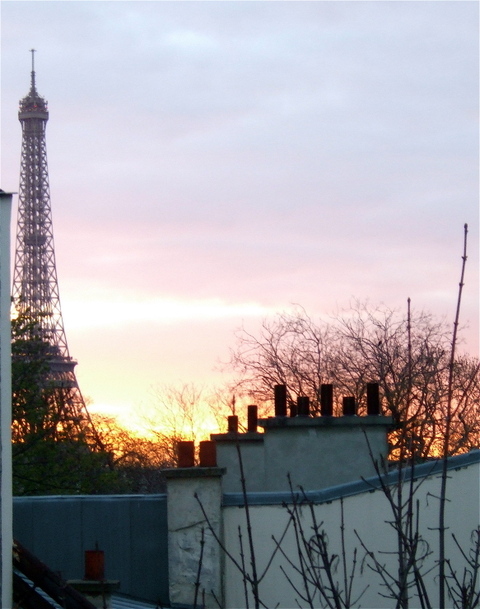 So, for right now, I can just manage posting two views of the sunset from my hotel window, taken tonight, seconds apart. Much more to come! Thanks for telling EDM about your drawings from Paris. It took me back to my wonderful experiences there myself. Wonderful sketches of Parisian sculptures. Merci, everyone! I wish you all could have been there with us! Ellen, what a wonderful month you'll have! I won't be there but I look forward to hearing about your stay. Ming, thank you---I'll change your url on my list soon. Marly, Paris was pretty bitter---well, at least semisweet. Agnes, what a lovely thing to say. Tu me donnes envie d'y être! 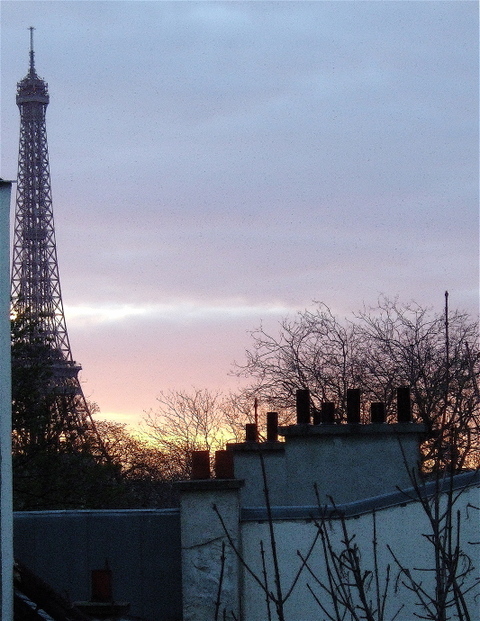 Paris is always extra beautiful when seen through your eyes, Laura.